Have you ever been curious about foraging for wild edibles? There are many ways to go about it, and some are certainly more effective and enjoyable than others. The most practical approach to wild edibles is incorporating them into your daily life. Here are some considerations to make next time you want to go out and forage. The benefits of foraging for wild edibles are as varied as the reasons why people do it. Foraging is an active, participatory way of connecting with the living landscape. It encourages closer observation and sensory engagement, and can help engage people of all ages in more positive physical experiences. Wild edibles add beneficial diversity to our diet, both in flavor and nutrition. Having knowledge of local wild edibles will also engender greater confidence in your ability to be resilient in challenging times, such as potential survival situations, whether in urban or wilderness contexts. Some plants are particularly good to focus on as ones to rely on in a survival situation: survival plants article. More specifically, here are some that are excellent ones to consider becoming more familiar with in desert regions: plants in the desert article. 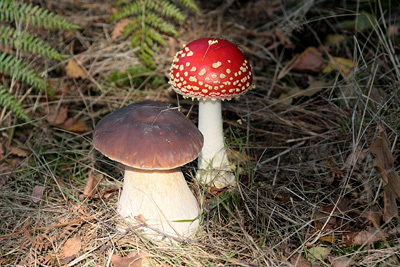 How far you travel when foraging for wild edibles is a serious question. The best place to start is generally right where you live, so consider doing some urban foraging. There is always some kind of wild edible nearby, even in and around big cities. It is more sustainable and practical to harvest wild foods from your local area. Although you may also want to wander further afield. Sometimes certain particularly tasty and nutritious wild foods require more time and travel but end up being worth the effort. I spend time every fall driving 50 miles from my house to seek out certain delectable wild edible mushrooms. This is a significant distance to travel, but I also tend to get a great deal of enjoyment out of being in the forest and looking for these mushrooms. Also, if my timing is right, I may come back home with enough wild mushrooms to last my family until next fall. I go to familiar locations I have harvested from for years and often foraging for wild edibles becomes a social event. - Avoid trampling sensitive and slow-growing species in the process of harvesting, such as stepping on trillium species. - Harvest sustainably by taking only a fraction of what is there, leave the rest to reproduce and feed others. A good practice is to harvest 1 in 20 plants, or 1 and 4 fruits (such as berries). - Learn about what benefits the growth of the species you harvest, and aid them in growing more abundantly if you can. This benefits not only the species you are harvesting, but everything else in relationship to it, including other animals, plants and fungi. An example of this is when harvesting late season stinging nettle stalks for cordage, strip off and drop the seeds at the site of harvesting to encourage more the next year. - Remove invasive species, which may compete with or choke out the species you are harvesting. Some wild edibles are themselves invasive, and so harvesting larger quantities of them can benefit the area. 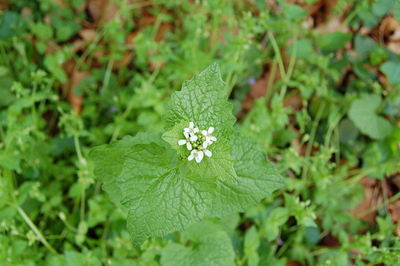 One example of an invasive that is also a good wild edible is garlic mustard (Alliaria petiolata). 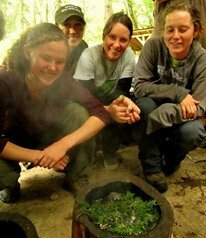 - Create or become part of a community of people that practice foraging for wild edibles. Part of stewardship is passing on the culture of proper harvesting ethics to the next generation and sharing the knowledge with your community. A great way to do that is have a wild foods potluck with your family, friends and neighbors. - Consider creating or supporting community spaces for wild foraging in your neighborhood and in your yard. Weedy green spots in neighborhoods, pea patch gardens and greenbelts can all serve as potential spaces for stewarding wild edible greens. 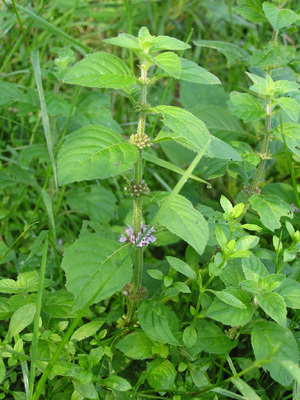 There are a few hazards to consider when foraging for wild edibles. First, make sure to only consume plants you have properly identified and avoid poisonous plants. A handful of plants are particularly hazardous, these include some of the most toxic plants in North America: Foxglove (Digitalis purpurea), Poison hemlock (Conium maculatum), Water hemlock (Cicuta douglasii), Poison oak (Toxicodendron diversilobum), Poison sumac (Toxicodendron vernix), Poison ivy (Toxicodendron radicans), Oleander (Nerium oleander), Castor bean (Ricinus communis), Larkspur (Delphinium ssp. ), Yew (Taxus ssp.) and Rhododendrons (Rhododendron ssp.). Another hazard to consider is local pollution on a wild foraging site. Avoid commonly polluted areas such as roadsides, areas near industrial lands, and those near agricultural sites, especially those that are not organic fields. Though tempting, roadsides are especially hazardous since they are commonly sprayed with herbicide and also collect petroleum wastes from leaks and from settling exhaust of passing vehicles. When foraging in urban areas, make sure to look closely for any signs of herbicide use or chemical contaminants. Also, be sure to ask permission when foraging on or near private property. Foraging for wild edibles should be fun, productive and beneficial. Using the suggestions mentioned here, see if you can further your own foraging practices and make them part of your everyday life. Get your friends, family and neighbors involved in fostering a long-term relationship with the living landscape around you through the practice of harvesting and tending wild edibles.